Iranian leaders have warned the Trump administration against withdrawing from the nuclear deal and have called on Washington to fully adhere to its commitments. 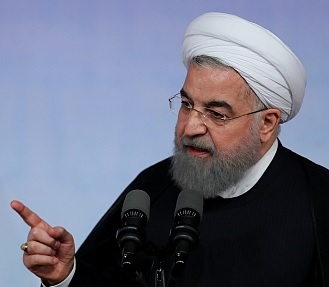 President Hassan Rouhani has accused the United States of being unreliable. Iran “will not remain quiet against the United States’ continuing to wriggle out of its commitments,” he told Parliament in August. The Trump administration is expected to announce the result of its Iran policy review in October, likely around the time that the White House must notify Congress whether Iran is complying with the deal and if the United States will continue to waive nuclear sanctions. Shortly after certifying Iran’s compliance in July, Trump hinted that he may not do the same in October. “We’ll talk about the subject in 90 days but I would be surprised if they were in compliance,” he told The Wall Street Journal. The following are excerpted remarks by Iranian officials on the status and future of the nuclear deal. “If the ill-wishing side, our rival and enemy, leaves an agreement, this is not a defeat for us, but rather a defeat for the opposite side." Withdrawing from the deal "will yield no results for the United States but at the same time it will generally decrease and cut away and chip away at international trust placed in the Unites States of America." What do you expect President Trump to say about Iran about the Nuclear Agreement? You made headlines by yesterday by saying the United States will pay a high price if it withdrawals from the nuclear agreement. Some might hear a threat in those words. Do you care to clarify what you mean by a high price? In a multi-lateral agreement, which has received the support of the United Nations Security Council and the core of it is a non-proliferation matter, the exiting of the United States from such an agreement would carry a high cost. Meaning, that subsequent to such a probable action by the United States of America, no one will trust America again. There is no higher price to be paid than this. Because, after such a scenario, which country would be willing to sit across from the United States of America and talk about international issues? Because the JCPOA was obtained after over two years of negotiations and dialogues, dialogues that included sessions over every single word contained in that agreement. Every word was analyzed many times by countries that were involved before its ratification. So if the United States were to not adhere to the commitments and trample upon this agreement, this will mean that it will carry with it the lack of subsequent trust from countries towards the United States. Because the greatest capital that any country has is trust and credibility. Trust and credibility. But do you also think that there is an economic price? Well, economically, right now, the conditions do exist for American enterprises, companies and entities, the conditions are very favorable. We see today that many companies from Europe, including France, Belgium, Italy, have come to Iran and are active and are undertaking joint ventures and investments with Iranian entities in the field of petroleum, petrochemicals, gas, water resources, infrastructure, rail transportation, air transportation, and other fields. The Americans can indeed use such an atmosphere to their benefit as well. Now, there are important contracts between different airlines in Iran and Boeing, and many of these dialogues and negotiations are almost in the last phases. So purchases by various Iranian airlines from Boeing would benefit the United States of America. Constructive relationships will benefit both nations, and the world at large. So, above and beyond, trust and credibility, better relationships in the region and across the word, more stability in the region, commercial and economic relationships, scientific and cultural relationships, between the people, warm relationships, tourism. Why would it be that the people of United States couldn’t come to see the historic and depth of culture that Iran and Persians have to offer? Why is it that Iranians couldn’t come to the United States and meet Americans and see what America is about? And I do think that preventing nations and people from getting to know one and other, from exchanging information and ideas, and science and knowledge and economic activities, it is a loss for the Americans. Those whom in America are called officials and are called decisionmakers in the government and the administration, at the very least, they should be focused on the benefit of their own people. So here we say this, will exiting the JCPOA benefit the United States of America, the nation, the people of America? It will certainly not. The existence of the JCPOA, what benefit does it carry? It paves the way and readies the continuation for cultural exchanges. For more exchanges. So the fundamental question is, is the relationship the way it has been carried for the past 40 years, has that benefited both nations and countries? No. We do think that are better pathways ahead that will benefit both countries and the world at large. If the US exits the JCPOA, would anything change from Iran’s perspective? Would Iran continue to abide by the terms of the deal? What other countries in the last few months have announced quite clearly, whether the Russians, the Chinese, or the European Union, all of it consisted of that they will remain committed to the JCPOA. Today this agreement is active, has been executed, fully implemented, and Iran has 100 percent adhered to her commitments. Based upon the reports of the International Atomic Energy Agency, which in every report has underlined that Iran has lived up fully to all of her commitments, particularly including vis-a-vis heavy water. So, if international agreements are based upon the liking or not liking of an individual, then, as we say, us Persians, no rock will be permanent on top of another rock. In other words, no one will ever see the resolution of issues through diplomacy. This means that there will be chaos. There will be bullying and threats of military action. If diplomacy ceases to mean what it has meant and it is to be defeated, then the second alternative, the other alternative is a military option. And everyone is to use their full military powers and options. So, therefore, we are quite hopeful that none of the sides of the agreement will decide to go outside of that framework and trample upon the JCPOA. If the United States exits the agreement, what will Iran do? To this question, in its specified timeframe will say what we will do. There are different ways. Different paths. We have held discussions in the country about the different options. On certain issues, we have already reached decisions and on others we are still holding meetings and going through analyses in order to reach a decision. There are options that we have. And we are not preoccupied by anything, because our support emanates from our people. And on this particular issue, this particular issue will unify all of the people. In other words, today the United States of America is in a position to solidify the 100 percent support of the Iranian people behind their institutions and government. If America were to exit… the Iranian people will see who the guilty party is that has decided to break international commitments. So, we do not see our side as sustaining a loss under this scenario. The losses would only be focused on the United States of America, and we have made ourselves ready for any situation. We will not have any problems. “The world has clearly seen that under Trump, America has ignored international agreements and, in addition to undermining the (nuclear deal), has broken its word on the Paris agreement, the Cuba accord, NAFTA and Transatlantic Accord and has shown to the world and even its allies that the United States is no good partner or reliable negotiator." As we see despite all deals & multiple talks on #JCPOA, US attitudes towards talks & their outcomes are totally oppressive, hounding& cruel. Enemies must know if bullying works elsewhere in world,it won't work for Iran. Retreat has no place when it comes to our national interests. “The officials of the country concluded that they should negotiate and they were even willing to ignore part of their rights in order to lift sanctions; however, today, we see that despite all the agreements and commitments, despite numerous talks, the attitude of US, towards these negotiations and their results, is completely cruel, thuggish and oppressive." “The Americans should know that the people of Iran will insist on their honorable and powerful positions, that retreating on important matters related to national interests is meaningless to the Islamic Republic, and the Islamic Republic will move forward." "The corrupt, untruthful, and deceitful officials of the US shamelessly accuse the people of Iran and the Islamic Republic of lying. That is while the people of Iran have moved forward in a sincere manner till this day, and they will continue this movement with sincerity until the end." "It is you who have lied. And those of you who lie do not want happiness and bliss for any nation. They (deceivers in the US government) condone everything at any price in order to ensure their illegitimate interests." The #JCPOA is not (re)negotiable. A "better" deal is pure fantasy. About time for U.S. to stop spinning and begin complying, just like Iran. There are a number of reasons the president and hard-liners in Washington think that the White House should pursue this path [to decertify the deal]. But their views are built on a set of false assumptions about the nuclear deal that should be laid to rest. First, some of the agreement’s opponents claim that the J.C.P.O.A. is “the worst agreement the United States has ever entered into with another country.” This ignores an important truth: The nuclear deal is not a bilateral agreement between Tehran and Washington. In fact, it isn’t even a multilateral deal that requires ratification in either Congress or the Iranian Parliament. It is, instead, a United Nations Security Council resolution. What the president and Congress decide to do about recertification is, ultimately, a domestic matter. But if the United States wants to remain credible in future multilateral negotiations, it cannot go against the international consensus and attempt to scuttle past diplomacy whether as political retaliation against a previous administration, or as part of a constant reassessment of American national interests. "If they [the United States] act like it then there will be hardly anything left from this agreement. So a new issue will arise on the international arena." "Regional and global conditions clearly show the presence of a risky process; the United States seeks to impose the idea that Iran is violating JCPOA and provoke the international community against Iran, a move which has not been successful so far."